Whether you like it raw, roasted or steamed, cauliflower rice is a versatile, low-carb base for any meal. Cauliflower rice, the lower-carb alternative to white rice and other grains, is giving the avocado a run for its money as the trendiest healthy ingredient filling up social media feeds these days. With the current popularity of low carb lifestyles and the ketogenic diet, it's not surprising. 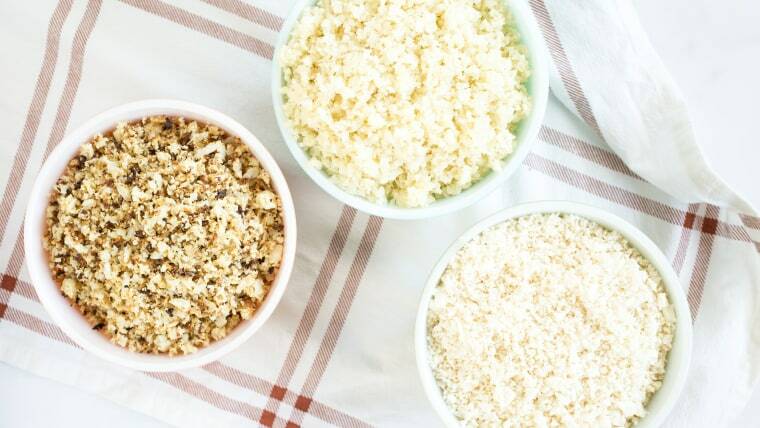 Whether you're trying to lighten up current eating habits or simply want to sneak more nutrition into your family meals, cauliflower rice makes the grade with its fiber content and versatility. And while supermarkets like Trader Joe's are hopping on the bandwagon and selling pre-made, packaged containers of cauliflower rice, it's actually easy to make it in just minutes in your own kitchen. The easiest way to make cauliflower rice. 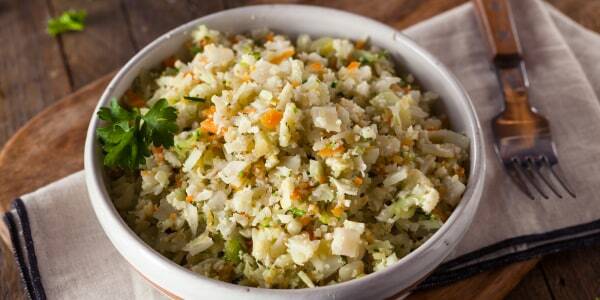 A food processor can quickly turn a whole head of cauliflower into fluffy "rice" granules in just minutes. Split a head of cauliflower in half, then slice out the core and green leaves at the base. Break that piece into golf ball-sized florets. Add the florets to a food processor fitted with the blade attachment, and then pulse in 3-second bursts, until the cauliflower breaks down into a fluffy, rice-like texture. If you don't have a food processor, these are the best-sellers on Amazon and they start at just $30. Get a great grater. If you don't have a food processor, you can also grate the cauliflower by hand. Prep the florets as noted above and use the largest holes on a box grater to shred the florets. If you're worried about shredding your fingers too, protect them with a cut-proof glove. If you need a new box grater, the best-sellers page on Amazon is a great place to look. One option has over 1,000 five-star reviews and is on sale for $10. Use your hands. If you don't feel like using a tool, hand chopping each cauliflower floret is another option — albeit a very time-consuming one. If you do go this route, note that it will take 10 to 15 minutes and the consistency in grain size won't be very even, and the texture won't be the same as if you were to use a food processor or box grater. TODAY Food recommends the grating or food processing techniques. Once you have your cauliflower rice on hand, you can use it raw or, depending on your tastebuds, cook it a few different ways and use in various dishes you already know and love. Many recipes call for sautéing or stir-frying cauliflower rice. 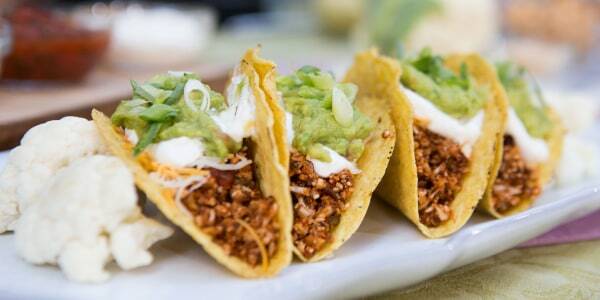 Here are three more wonderful ways to prep and serve it. With its slightly nutty flavor and crispy texture, roasted cauliflower rice makes a tasty side dish on its own. Mix in Parmesan cheese or nutritional yeast for extra flavor, if desired, and pair with roasted chicken or grilled vegetables. Or, use it in place of breadcrumbs atop sautéed greens, as a soup garnish, or on top of macaroni and cheese for a little extra crunch. Preheat the oven to 400 degrees and line a rimmed baking sheet with parchment paper. Spread the cauliflower rice in a single layer. Spritz with cooking spray or drizzle with olive oil, and gently toss it all together with a spatula to evenly coat the "grains." Roast for 15-20 minutes, or until the cauliflower starts to brown and caramelize. With a neutral flavor and tender texture, steamed cauliflower rice can be used in place of white or brown rice in stir-frys or as a base for a filling burrito bowl. You can also fold it into baked casseroles for a nutrient-packed addition, or add a few spoonfuls to your favorite meatloaf or meatball recipe for extra bulk without adding too many extra calories. Add 2 tablespoons of water per 1 cup of cauliflower rice to a covered skillet or a sauté pan over medium-low heat. Cook, stirring frequently, for 5-8 minutes, until the cauliflower rice reaches the desired tenderness. Alternatively, microwave the cauliflower rice and water in a covered bowl for 3-5 minutes, stirring as needed, until cooked. With a crunchy texture and distinct veggie flavor, uncooked cauliflower rice makes a versatile topping for salads, grain bowls or even avocado toast. To impart more flavor, toss the cauliflower rice with avocado or a nut oil, your favorite spices and/or finely zested lemon peel. Store the cauliflower rice in a lidded container in the refrigerator for up to five days. TODAY has affiliate relationships, so we may get a small share of the revenue from your purchases. Items are sold by the retailer, not by TODAY. All prices are subject to change and items could sell out based on the merchant’s inventory.